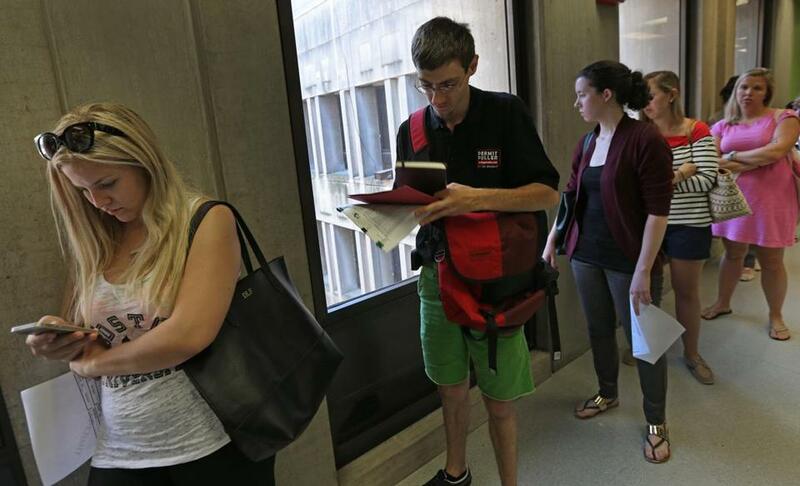 Patrick LaRosa of Permit Pullers waited at Boston City Hall to get parking permits for clients, many of whom are students. Dave Backman does not like standing in line. About 10 years ago, after his wife had to make several trips to Boston City Hall for a permit to park a dumpster on the street in the North End, he was struck by an idea: No one else likes standing in line, either. In that moment, Permit Pullers Inc. was born. The company provides a service that goes to City Hall and obtains street parking permits for dumpsters, temporary storage pods, and large equipment such as construction vehicles. But its biggest demand is for permits for moving vans, and with thousands of college students returning to Boston this is one of its busiest weeks of the year. In student-heavy neighborhoods of Greater Boston, it can be difficult to find a parking spot for a 40-foot moving truck, or even a 20-foot U-Haul around Aug. 31. Some neighborhoods have several trucks reserving spots on a single block, risking crowding out residents, and the North End is completely saturated with moving van reservations, said Backman. Like many cities, Boston and Somerville provide permits that allow movers to reserve curbside parking. Getting one, though, usually entails waiting in line at City Hall for several hours. The permit includes temporary no-parking signs that must be posted at the location a day or more before the move-in. For college students in particular, arriving from out of state in their moving vans, the time involved in getting the permits and signs can be a major inconvenience. Permit Pullers will have someone wait in line to get the parking permit, while another employee zips around on a motor scooter putting up the temporary no-parking signs, and then taking them down after the move is complete. The permits cost $69 in Boston, $40 in Somerville, and less in neighboring communities, according to Permit Pullers The company charges an additional $60 to $100 depending on the municipality, for its services. Having a permitting system is better than having moving vans blocking streets, said Susan Clippinger of Cambridge’s Traffic, Parking and Transportation Department. “Without the permitting, we were getting moving activity that was blocking travel lanes and blocking emergency vehicles,” said Clippinger. Half of the 6,000 permits issued by the city last year were issued in June, July, and August, she said. Word seems to be getting out. The demand for Permit Pullers’ services in Boston is about 20 percent higher this year than last year, Backman said. The firm has lined up about 20,000 permits in the last year in about 90 cities in the United States and Canada. Jack Newsham can be reached at jack.newsham@globe.com.